Why not be a man and manage the situation better? 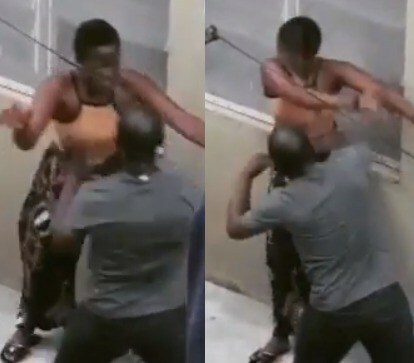 A JAMB lesson teacher has been filmed physically assaulting one of his female students in Surulere area of Lagos. “Her only problem was him constantly beating her on her head. But this teacher wouldn’t listen, saying she has no right to tell him where he should flog her on... She attends Jamb lessons their... I don’t care what she did.. No one has the right to hit a student that way. I asked a student there for the teacher’s name ( the boy on the red shirt) and he says the girl deserves to be beaten... I was Shocked... Like for real!! This is right to him… Addressing any situation with violence [is wrong]! I thank God he isn’t my kid brother... Violence is Never the ANSWER!! Never. These youngsters can’t be made to believe that violence is the only way..!! In 2019. This happened at No 13 Simisola Estate, off Olufemi street on Ogulana drive, Surulere, Lagos-Nigeria. Zee Lessons."